Sage (Salvia officinalis) is often called culinary sage, common sage, or garden sage. Sage is native to the Mediterranean and belongs to the mint family—the same family as basil, thyme, rosemary, lavender, and oregano. Sage has a long history in herbal medicine. The many proven sage health benefits include treating memory loss, improving digestion, boosting immunity, regulating cholesterol levels, treating diabetes, and reducing menopausal symptoms. For centuries, sage has been part of herbal medicine, whether that is Ayurvedic medicine or traditional Chinese medicine. Traditional herbalists have used sage to enhance memory; reduce diabetes symptoms; lower high cholesterol; and treat cold sores, sore throats, and menopausal symptoms. At the same time, sage tea benefits digestion and reduces intense menstrual pain for some. Throughout history, folk healers have recognized sage’s memory-boosting powers. But there are encouraging results from modern medicine. British scientists in 2003 proved that people who took sage oil capsules performed far better on a memory test. 5PHThey took 44 healthy adults and gave them either sage oil pills or placebos. All of them performed a word recall test to see how many words they could remember that they were shown previously. Time after time, researchers found that those taking sage oil performed significantly better. Because of this memory link, sage has been put under the microscopes of those searching for alternative ways to deal with Alzheimer’s disease. Research has found in the past that sage seems to stop one particular enzyme that breaks down acetylcholine, a chemical messenger from the brain. Dementia is often accompanied by a drop in acetylcholine in the brain, so the thinking goes that sage could prevent this drop. A second study in 2003 tested sage versus placebo on 42 people with mild-to-moderate Alzheimer’s disease. The results suggested that those taking the herb had at least modest improvement in mental function. The antiviral qualities of sage may help against cold sores, caused by the herpes virus. Use sage cream and apply directly to the sore. A notable study found that a topical treatment with a cream containing both sage and rhubarb was as effective as a mainstream cream—healing the sores in about the same amount of time (a week). In Germany, sage is approved for treating stomach distress. It has a long history in folk medicine, but a study also tested sage against the bacteria H. pylori in the stomach. Sage was boiled and eaten. While it didn’t actually kill the bacteria, sage was found to exert antibacterial effects on H. pylori. It seems that, for now, using sage in cooking when you have stomach distress might be a good idea, but stop short of using sage capsules for this purpose. Other research suggests that sage leaf extract inhibited gut motility, and treated both diarrhea and abdominal colic. One potentially great effect of sage could be in relieving a sore throat. One study of nearly 300 people found that a throat spray created with 15% sage significantly lowered throat pain compared to placebo. Patients in the study found relief within two hours of using the spray. Sage benefits those with high cholesterol as well. High cholesterol can increase the risk of heart disease, including complications such as strokes or heart attacks. A study published in the International Journal of Molecular Sciences in 2009 evaluated sage tea benefits on six healthy women from the ages of 40 to 55 years old. The researchers specifically looked at cholesterol, lipid profile, and blood glucose regulation. After four weeks of sage tea consumption, there had been no effect on glucose regulation. However, during treatment and two weeks after treatment, there was an improvement in lipid profile with lower total cholesterol and LDL (low-density lipoprotein) cholesterol levels, and an increase in HDL (high-density lipoprotein) levels. In the U.S., about 10% of people have diabetes, and another 20% have pre-diabetes. Diabetes is a common group of chronic metabolic diseases that lead to high blood sugar levels due to problems with insulin resistance. The anti-diabetic effects of sage tea have been proven in animal studies. A study published in The British Journal of Nutrition in 2006 concluded that sage tea has a similar effect to the diabetes drug metformin on rat hepatocytes. This suggests that sage may help prevent type 2 diabetes by reducing blood sugar levels in people at risk of diabetes. Another study published in the journal PeerJ in 2018 examined mice fed a high-fat diet to induce obesity treated with sage, to determine whether the herb was an effective diabetes treatment in obese mice. The mice were treated with either an anti-diabetic drug called rosiglitazone or sage methanol for five weeks. In the sage group, there was an improvement in insulin sensitivity and lowered inflammation, and this led the research team to conclude that sage is an alternative to pharmaceuticals in the treatment of diabetes. Common menopause symptoms include headaches, hot flashes, night sweats, dizziness, heart palpitations, cold feet and hands, mood swings, and a reduced libido. These symptoms result from hormonal imbalances, such as reduced estrogen levels. A study published in the journal Advances in Therapy in 2011 found that consumption of sage tablets daily for two months reduced hot flashes and other menopausal symptoms in 71 patients. Sage had decreased severe hot flashes by 79%, while lowering very severe flashes entirely. The results suggest that sage can be a viable natural treatment for menopausal symptoms. How Is Sage Used in Cooking? There are many sage uses in cooking. For instance, sage is quite popular in European cuisines, including Turkish, Balkan, and Italian cooking. Sage pairs well with any meat, including poultry and pork. It can be eaten ground or whole, and is often used as an ingredient in stuffing to accompany a chicken or roast turkey for Thanksgiving Day or Christmas. Sage also adds a lot of flavor to tomato sauces, polenta, pesto, potatoes, omelets, pasta, and chicken risotto. The herb combines well with oregano, onion powder, parsley, garlic powder, bay leaf, marjoram, thyme, and rosemary. Sage can also infuse well with syrups to create cocktails and other beverages. Large sage leaves can be sautéed for a flavorful and crispy chip that can help garnish a dish. Since cooking sage softens the flavor, for a mild taste, add the sage close to the end of the cooking process. But if you enjoy a more robust sage flavor, add it at the beginning of cooking. Also, a little sage goes a long way, and if you haven’t used it before, just use a small amount and add more once you get used to it. Are there other good sage uses? Sage tea makes an excellent drink since it is flavorful, soothing, and caffeine-free. To make sage tea, simply pour a cup of boiling water over a tablespoon of sage leaves, and let it steep for 10 minutes or until it has reached your desired strength. Strain the leaves before consumption. Sage is considered safe for most people, and it will cause little-to-no side effects when consumed in amounts common for recipes. That being said, sage may be an issue for people taking this herb in high doses for long periods of time. Common sage contains a chemical called thujone, which is thought to be poisonous in significant amounts. Thujone can cause seizures and damage to your nervous system and liver. If you have a seizure disorder, it is especially important that you don’t consume sage in amounts larger than what is typically found in food. Are there any drug interactions associated with sage? Since sage may lower blood sugar, taking sage along with diabetes medications may lead your blood sugar to drop too low. As a result, you may need to change the dose of your diabetes medication. You will also need to monitor your blood sugar closely if you use sage when taking diabetes medication. Some diabetes medications include glipizide, tolbutamide, chlorpropamide, insulin, glyburide, rosiglitazone, and glimepiride. Sage may also reduce the effectiveness of drugs used to prevent seizures, such as primidone, phenobarbital, gabapentin, valproic acid, phenytoin, and carbamazepine. Sage may also cause too much sleepiness when taken along with sedatives. Common sedatives include lorazepam, clonazepam, and zolpidem. The history of common sage can be traced back thousands of years. Roman naturalist and historian Pliny the Elder described sage being used as a diuretic and a local anesthetic. 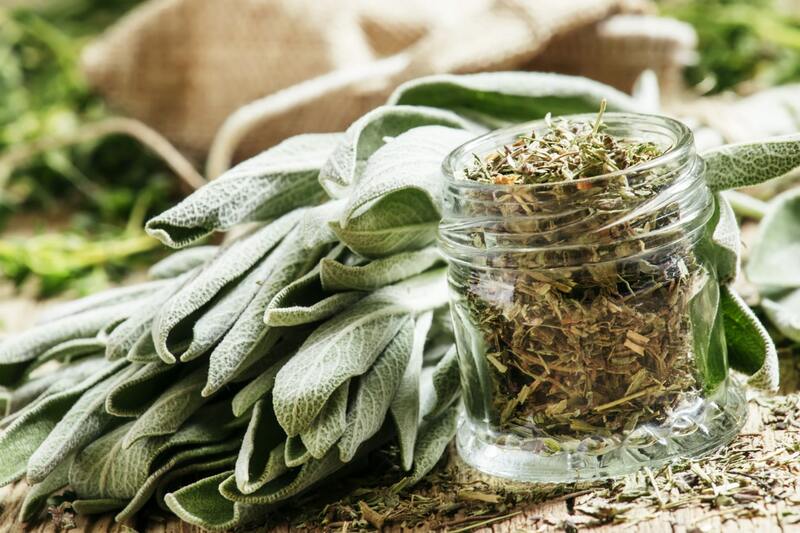 Today, sage health benefits include helping with Alzheimer’s disease and dementia, improving digestion and relieving diarrhea, treating diabetes symptoms, relieving sore throats, treating menopausal symptoms, and regulating cholesterol levels. From a culinary perspective, sage is used in a variety of ways and can add flavor to chicken risotto, tomato sauces, polenta, potatoes, pesto, omelets, and pasta. It also pairs well with pork, turkey, and chicken. Sage also makes a flavorful and soothing tea. Sage is considered safe when consumed in amounts typical for cooking. Consult your doctor before consuming sage if you also take sedatives or drugs used for diabetes or seizures. Mugwort Benefits: Is the Herb Effective for Joint Pain, Depression, Malaria, and Cancer? Ben Khedher, M., et al., “Preventive effects of Salvia officinalis leaf extract on insulin resistance and inflammation in a model of high fat diet-induced obesity in mice that responds to rosiglitazone,” Peer J, January 9, 2018; 6:e4166, doi: 10.7717/peerj.4166. Sa, C., et al., “Sage Tea Drinking Improves Lipid Profile and Antioxidant Defences In Humans,” International Journal of Molecular Sciences, Sept. 2009; 10(9): 3937-3950, doi: 10.3390/ijms10093937. Bommer, S., et al., “First time proof of sage’s tolerability and efficacy in menopausal women with hot flushes,” Advanced Therapies, June 2011; 28(6): 490-500, doi: 10.1007/s12325-011-0027-z. Hamidpour, M., et al., “Chemistry, Pharmacology, and Medicinal Property of Sage (Salvia) to Prevent and Cure Illnesses such as Obesity, Diabetes, Depression, Dementia, Lupus, Autism, Heart Disease, and Cancer,” Journal of Traditional and Complementary Medicine, April to June 2014; 4(2): 82-88, doi: 10.4103/2225-4110.130373. Lima, C., et al., “Metformin-like effect of Salvia officinalis (common sage): is it useful in diabetes prevention?” The British Journal of Nutrition, Aug. 2006; 96(2): 326-333, PMID: 16923227. Moncel, B., “Sage: How It Tastes and How to Use It,” The Spruce Eats, last updated March 26, 2018; https://www.thespruceeats.com/what-is-sage-1328645, last accessed September 26, 2018.